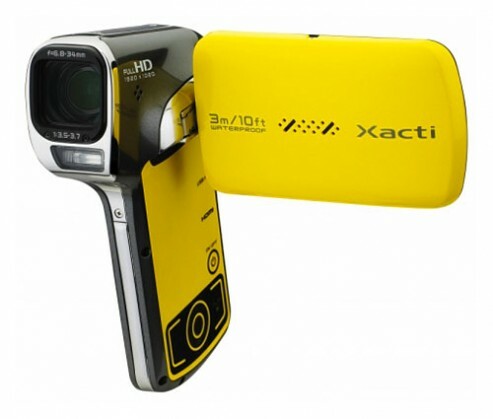 A full HD compact and waterproof camera recorder from Sanyo is dubbed Xacti VPC-CA102YL. This waterproof camcorder capable of taking 14MP still photos, able to record MPEG-4 video in AVC/H.264 format for easier online video sharing. Other mentioned features including 14.4MP CMOS sensor, 38mm wide-angle lens, 5x optical zoom, 12 x double-range zoom, 2.7-inch TFT LCD display with 285 degrees turn, mini HDMI port, USB port, rechargeable lithium-ion battery, read SD, SDHC or SDXC memory cards, Wi-Fi data transfer via Eye-Fi SD cards technology, 1080 60i at 1920×1080 pixels resolutions. Sanyo Xacti VPC-CA102YL has a dimension of 3.37×1.47×4.34 (WxDxH), weighing about 5.5 ounces. The waterproof features withstand up to 10 ft depth. Sanyo Xacti VPC-CA102YL camcorder will be available by August this year. Price: USD349.99.